A beautiful game of tactical construction for 2 players. Pagoda is a great game for someone looking for a quick playing tactical 2-player game. An additional bonus is that the 3D Pagodas are built with colorful columns and tiles giving the game a cool look and feel. The object of the game is to score more points than your opponent. 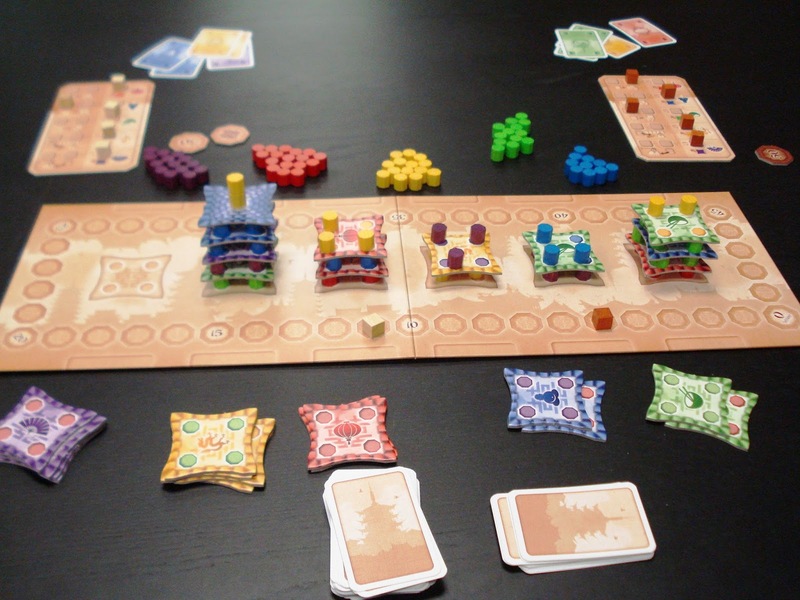 Game play is centered on a small board with room to construct 6 Pagodas. A finished Pagoda consists of 4 floors with each floor having 4 columns of one color topped with a tile of the color of the columns. The 4th floor must be capped off with a spire of 2 columns that are the same color as the 4th floor tile. Once the 3rd Pagoda is finished the game is over ant the player with the most points will win. Players begin the game with 5 cards, one of each color of the types of columns and floor tiles, placed face up in front of them plus 2 random cards in their hand. Players can take up to 3 actions per turn. It costs one action per column built, and one action per floor tile placed. One point is awarded for each column built on the ground floor, 2 points for each column built on the 2nd floor, with 3 points for those on the 3rd floor and 4 points earned on the 4th floor. One point is awarded for each floor topped with a tile. Five points goes to the player who tops the 4th floor with a spire that consists of a double column in the same color as the tile. There are a few other rules like all columns on a floor have to be the same color. When a player places a floor tile they get to claim one of 5 special abilities that can be used on a future turn. The crux of Pagoda is to know when to build on which Pagoda to maximize your points without setting up your opponent for a big score. This game is fun, tactical and pretty to look at when finished. 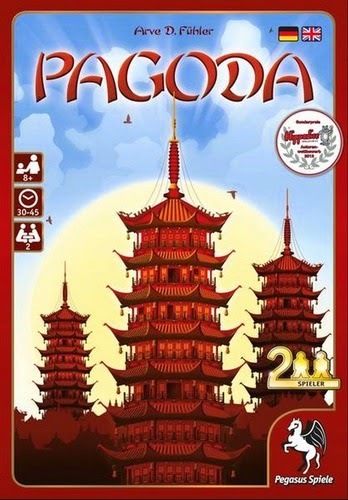 We have an open copy of Pagoda available in our Demo Games Library for you come in and try.